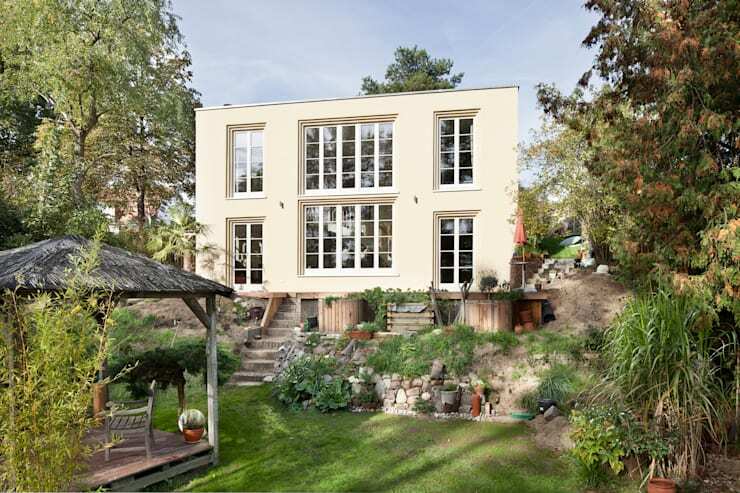 Here at homify we see a lot of homes with deceiving exteriors and façades—from lavish dwellings tucked away behind modest frontages to opulent villas disguised by humble curbside views. Today’s property is no exception. Boasting a simple and unassuming cottage exterior, this residence is seriously impressive. 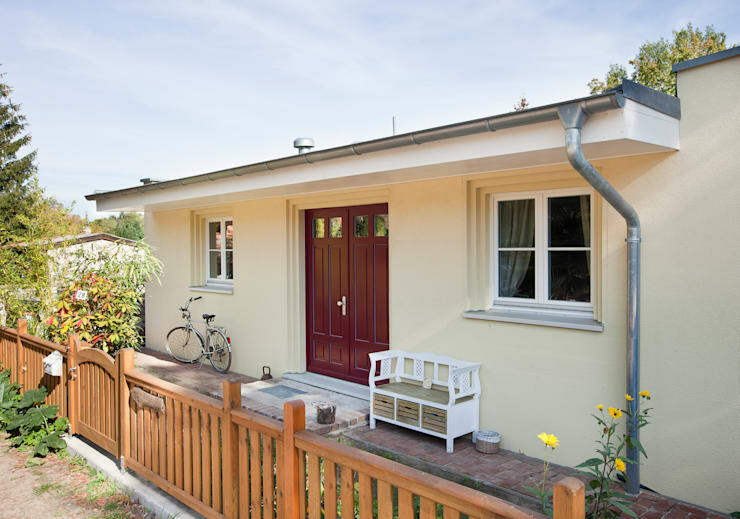 Idyllic and charming, the cream stucco fascia is uncomplicated and simple, while the interior is striking, large and eye-catching. Designed by the team at Mueller’s Office, this abode is a space-optimised dwelling that provides a host of attention-grabbing features and fixtures. If you’d like to check out this astonishingly remarkable house, read on below and see if you’re as surprised as we were! Cute, cosy and inviting, this modern cottage ticks all the boxes. From the front of the house we see a rather compact looking abode, with bright burgundy doors and simple square windows. 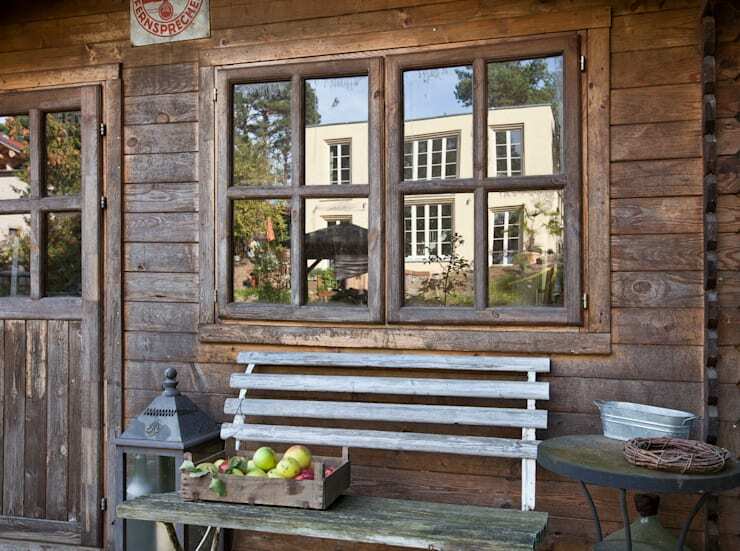 A small bench seat offers the frontage an area for people watching, while the timber fence is quaint and charming. Wow! Were you expecting this? The surprising exterior is unbelievably luxurious, with plenty Moving around the rear of the home we see a completely different looking dwelling that is far from compact or small. Double storeys ensure the property boasts plenty of living space for the entire family, while the cream hue and white window frames are continued on the fascia. Inside the home we see that the architects have employed double height ceilings to embrace an illuminated and spacious aesthetic. 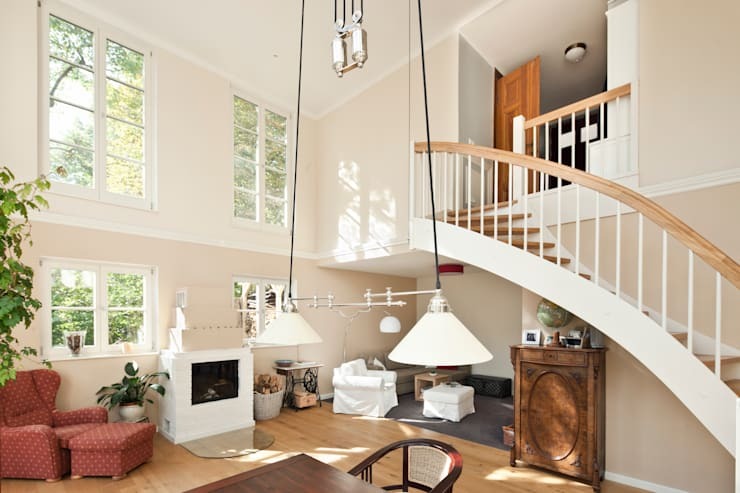 A sweeping staircase follows the wall and provides a way to ascend between levels. We’re also able to see that the living room is tucked into an alcove, ensuring the occupants feel snug and cosy in the large and open space. 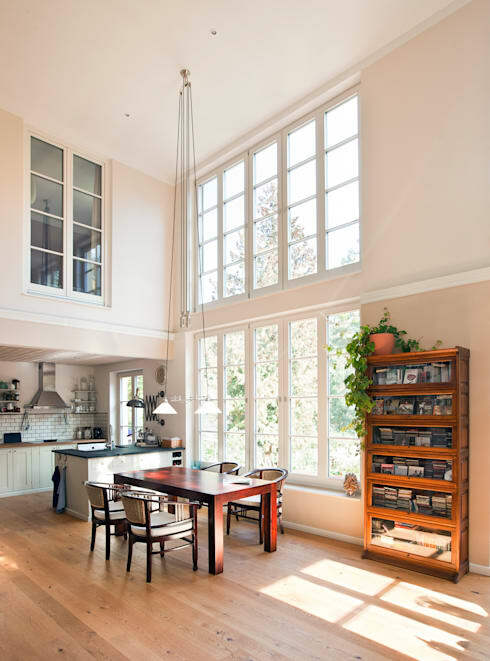 Upstairs the bedroom is cosy and light-filled, with French doors that open within the double height living space below. Another window looks out into the garden, offering the room’s occupants a wonderful array of views and scenic panoramas. 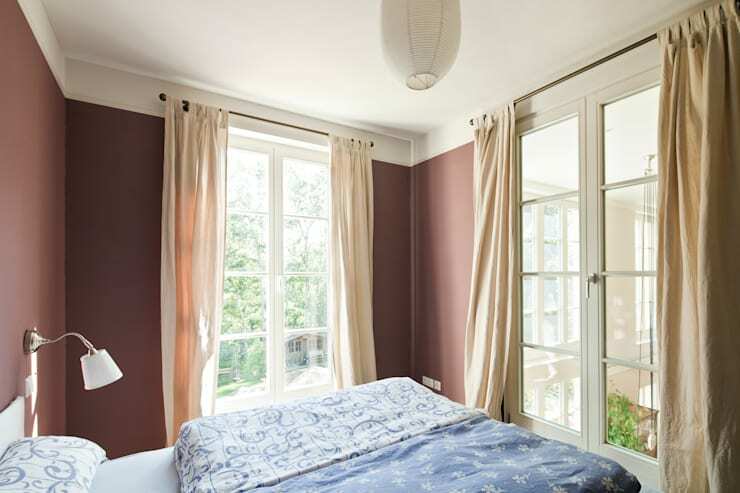 The wall colour is also particularly alluring, with a rich yet dusty burgundy hue that imparts depth, and compliments the cream curtains and white ceiling perfectly. The bathroom boasts a rustic aesthetic, and shows us the timber double doors that evoke a feeling of majesty and elegance. The vanity provides ample space for accessories, while art has been added to infuse character within the room. As the sink faces a window, a moveable mirror has been employed to offer practicality and efficiency. To give you a better idea of the layout of this abode, we head back upstairs into the bedroom to take a look out of the window. The dining table is just below, and segregated with two suspended lights. A fireplace offers warmth for the room, and is flanked by a cosy armchair with ottoman, ideal for reading, napping or sipping a nice hot chocolate. The kitchen is located in the corner of the room underneath the bedroom, with neat subway tiles and cottage style joinery. 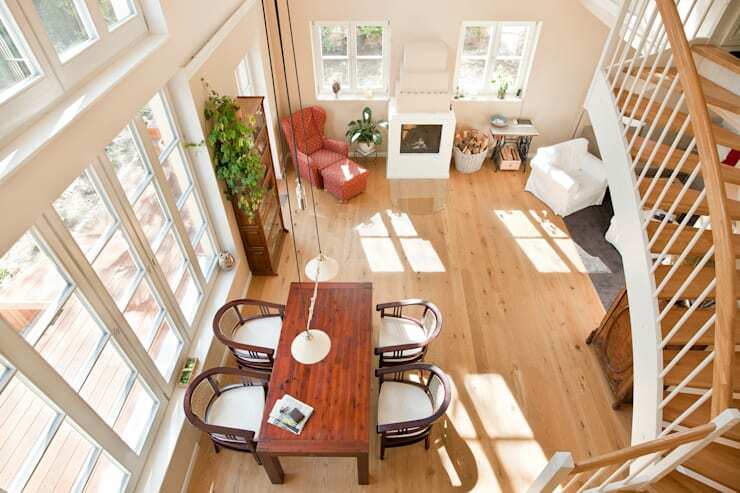 Light and bright, the room is wonderfully chic, with high ceilings that ensure the space feels idyllic and tranquil. Before we end our tour of this truly intriguing and surprising cottage, we head back outside to take a peek at the garden shed. An adorable cabin, this space is perfect for storage, and overlooks the exterior terrace, and boasts an impressive view of the rear façade. What did you like or dislike about this modern cottage?